Free Shipping Included! Satya Jewelry Womens Rhodonite Rose Gold Mandala Stretch Bracelet Set, One Size by Satya Jewelry at Femi Store. MPN: BRG1-SET. Hurry! Limited time offer. Offer valid only while supplies last. Welcome the possibility for growth and love that each day brings. 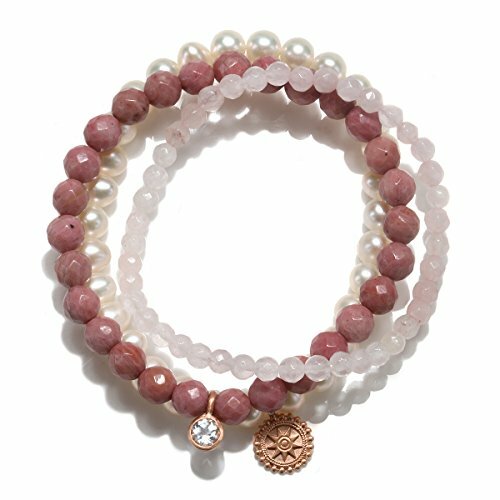 Stretch bracelet set of pearl, rhodonite, and rose quartz stones features mandala charm, sacred infinite cycle. 4 & 6mm stones make up this stretch bracelet set with 10mm Mandala charm. Rose Gold plated brass. Rose Quartz represents unconditional love, compassion. Rhodonite for inner growth. Pearl for innocence and beauty. Mandala represents the sacred infinite cycle. Karseer Black Matte Onyx and Lava Energy Stone Beaded Stretch Bracelet, Retro Bronze Skull Gothic Punk Charm with Red Agate Emphasized Personality Bangle Jewelry Birthday Gift Unisex 7"